Random linguistics thing to start out, I usually type in “inphil” to get to my own blog, which I always correlate with Infl, you know, like InflP? Ok, so we’re not there yet. 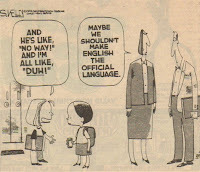 To start, if you haven’t studied linguistics, you do not know what linguistics is. I don’t care if you think you do, because you really don’t. And if you’re one of those people who meets a linguist and then starts talking non-stop about everything linguistic you know, we hate that, b/c what you’re talking about is 99.9% of the time NOT what we do. If you think the Cyrillic alphabet is interesting, and that every modern English word can be traced back to Greek, or that technology will quickly lead to the abysmal end of all civilized communication, that’s nice for you, but that’s not linguistics. There are several subfields, and major divisions can take labels like “theoretical”, “applied” and “experimental” – really we’re not that different from other more traditionally scientific fields, we just don’t get credit for our scientific inquiry (and if psychology can pass as a science, linguistics is 5 times the science). What I do is theoretical, but applied and experimental are much more salient to the non-completely abstract minded. Sociolinguistics interests many a layperson, and involves the interaction between language and society (its like some sort of genius fit it all into one word or something!). Socio (for short) addresses things like how dialects of a language differentiate from one another, which can involve geographic and political factors (fun fact: Hindi and Urdu are the same language but b/c of political/religious reasons have different names and use two different writing systems Devanāgarī/Arabic). The usage of “like” in English (And he was all like, I’m like totally like going crazy… like), the frequency of thinking vs. thinkin’, and various words, phrases, intonations and sounds all fall under socio, correlating them to socio-economic class, age, gender, etc. Some experimental linguistics includes language acquisition, like watching babies and seeing how they start to talk – what sounds they can say first, what sentences they form and how old they are when the put it together. A classic example is the U-curve (I think that’s what it’s called…. I’m not an acquisitionist). This is where kids acquiring English, for example, will say something like “The rabbit went,” which sounds like a perfect sentence, but will a little later say “The rabbit goed”, and then again later return to “The rabbit went.” What this pattern is meant to indicate is that early on a child has rote memorization of verb forms including irregular ones (e.g. be/are, hold/held, teach/taught), but that in the second step the child has learned that if you add –ed to the end of verb you can make past tense (e.g. walk/walked, jump/jumped). This is actually a step forward in their development b/c the kid understands the base form of the verb and that it’s a separate piece of stuff, –ed, that makes it past tense. Then the final stage is where the child has sifted through the regular and irregular verbs to talk like a normal adult crazy English speaker. Having TA-ed an intro class is coming in handy here. Ok, but I don’t do those kinds of linguistics. Theoretical breaks down into syntax, semantics, morphology, phonetics and phonology. Phonetics is the sounds that we make with language, and phonology is the sound patterns or systems of a language (for accessibility, pretty much all my examples will be from English here). For example, ever notice how you say “an iron” rather than “*a iron”? I’m sure you’re aware that you have to say ‘an’ before a word that begins in a vowel (if you’re the kind of person who says “an historic”, please leave my blog immediately), which is part of phonology – we don’t like to say too many vowel sounds in a row so the ‘n’ at the end of ‘an’ breaks it up. This subfield also includes things like stress patterns. Assuming you do trisyllabic laxing, say “divine”, then say “divinity” (serene/serenity, school/scholarly, profound/profundity). Same word, different sound (pay attention to the vowels – try saying “divine” normally, then add –ity the end, it’ll be weird). This is phonology, and you can predict how the sounds will change based on the number of syllables in the word and the nature of if suffix (e.g. –ity) that is added to a word. 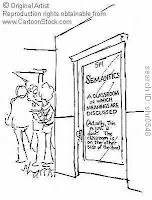 Semantics is the meaning of language, slash the meaning of sentences. It tries to address how to get the meaning of a sentence by compositionally putting together all the words to get a truth value – closely related to philosophy. Again for examples, consider “Georgio bought an expensive BMW.” At first glance the sentence seems straightforward enough, but it really has two meanings. Meaning(1): Georgio bought theee most expensive BMW on the market (760il?). Meaning (2): BMW’s are expensive in terms of the average car, but Georgio actually bought the cheapest BMW money can buy. And semanticists care about how we get the two meanings, blah blah blah. Taking a breather at this point, understand that if you thought, for example, that sociolinguistics is the most or only important area of study in terms of language, you’re wrong. You need the theory behind it to even investigate such things. If all you’re interested in for language is how people use it, and what is meant by different usages, you and I are different people. You’re allowed to be interested in that but you are NOT allowed to think that the aspects you’re not interested in are unimportant, or even less important. Unless you want to be a huge jerk times a million forever. I personally don’t really care about how people use language in society, meaning I don’t spend any time researching it. Other people have got it covered as far as I’m concerned. One question in this subfield is how do we restrict what affixes attach to which root. –ity, for example changes an adjective into a noun: stable/stability. But it can’t attach to just any adjective root: tall/*tallity. (It turns out –ity only likes the Latinate roots). To understand a little syntax, and why I study it, I have an example with the contraction “wanna” for “want to”. One can say things like “I wanna go to the store.” Or “Do you wanna leave now?” It would seem that wherever you have “want to” you can replace it with “wanna”. Not so! One can form the question “Who do you want to go home?” from something like “I want Tim to go home.” But you CAN’T say “*Who do you wanna go home?” That’s b/c where Tim used to be (after ‘want’ and before ‘to’) before we turned him into ‘who’ and put him at the front, there is a gap, and you can’t make a contraction over a gap. Neat, eh? So syntacticians look at the underlying sentence structure, b/c if we just looked at the surface structure there’s no reason ‘wanna’ should be bad anywhere ‘want to’ occurs. Does this make sense? -We do not correct peoples’ grammar dependent on what your grade 10 English text book said you should say. We are interested in how people actually talk, not how some stuffy librarian tells them to speak. 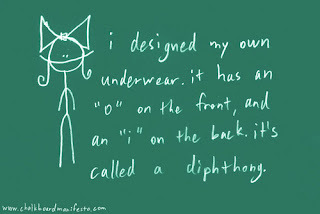 -Pretty much anything to do with spelling doesn’t apply to the average linguist – its not language, its orthography, i.e. a conventional representation of language. -Most of us are not judging how you talk when you’re in conversation with us, if we’re paying attention at all we’ll probably just find you fascinating. -We don’t discuss which languages or dialects are better than others, b/c we believe that all languages and dialects are equally complex and good – they all form natural languages. -NO, I do NOT speak Tolkien’s elven language, or Klingon, or Esperanto – linguists are not about FAKE languages, we study REAL languages, and the fake ones never come close to cutting it in comparison with the real ones. -I’m sure there’s more, but I’m drawing a blank. We are concerned with how all languages are similar to each other at some level, and how language is represented in the brain. Language is specific to humans, and b/c of how children learn it so quickly and perfectly suggests that our brains are prewired to acquire any natural language. 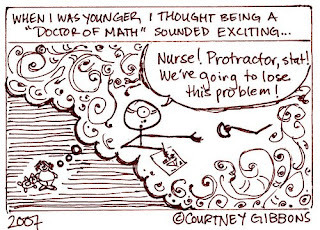 Me, I’m into patterns (getting back to my pure math roots), and systems and all such manner of thing. Posted by R at 12:30 p.m.
wow, that was actually really interesting! Also, I imagined you explaining all this to me in a skeevy hotel room in Calcutta. now can you explain the title of your blog? This was a great entry! Not that your other entries are not great. But very informative and also very Bethany-like. I've never I don't think heard an explanation of the blog title, I just remember assuming it had to do with the book of Revelation. But why choose Philadelphia over the others?